The Forthcoming FIG Commission 2 Workshop 2015 in Kathmandu, Nepal "Strengthening Education for Land Professionals and Opportunities for SDI Development" is a joint event of FIG Commission 2 and ISPRS Working Group IV/4 together with the Nepal Institution of Chartered Surveyors (NICS) and the Nepal Remote Sensing and Photogrammetric Society (NRSPS). More information is to come. FIG Commission 2 had its Annual Meeting during the XXV FIG Congress 2014. Read also about the Technical Sessions and all the other activities that FIG Commission 2 was involved with during the busy time in Kuala Lumpur. ISPRS co-sponsored workshop on ?Innovative learning tools 2013 with specific emphasis on Strategies for Earth Resource Management? to be organized during 20 - 21 December, 2013 at CEPT University, Ahmedabad, India. The 24th Biannual SaGES Colloquium & FIG Regional Conference takes place 17-20 June 2013 in Texas at Tyler, USA. The conference is co-organised by FIG Commission 2 and the Partnership Degree Program in Surveying and Mapping at Tyler Junior College and the University of Texas at Tyler. Commission 2 had its annual meeting during the FIG Working Week 2012 in Rome, Italy, 6-10 May 2012. The General Assembly appointed Ms. Liza Groenendijk from The Netherlands as the Chair Elect of Commission 2 for 2013-2014. 21-25 October 2013 in Yaounde, Cameroon the 2nd Surveying Week: Building Capacities in Land Reforms and Land Management will be helt jointly with the annual assembly of Commission 2 and Commission 7 and the general assembly of the FGF. THe conference is organised by l'Ordre des G?m?res du Cameroun, FIG Commission 2 and Commission 7. Commission 2 had its annual meeting during the FIG Congress 2010 in Sydney, Australia, 11-16 April 2010. The General Assembly appointed Prof. Steven Frank from USA as the Chair of Commission 2 for 2011-2014. FIG Commission 2 ? Professional Education and the University of East London will jointly organise a workshop in London, United Kingdom, 26-28 August 2010. The goals of the workshop are to share ideas and experiences in surveying education, and to meet potential collaborators for future research and cooperative teaching opportunities. The main topics are education standards and accreditation, e-learning, core surveying knowledge, good learning and teaching practices, cooperative learning and training, education management and marketing. This question is often posed by prospective students, educators in secondary educational system and the general public. An example about the answer from Ireland is available now at http://dit.ie/faculties/built/spatial-planning/animation/. The clip was developed by the Dublin Institute of Technology. It describes visually in detail the breadth of Geomatics professional competencies, the cross-sectoral nature of the discipline and the inter-professionalism of Geomatics as a potential career path. Provided by Helen Murray-O'Connor. Commission 2 Annual Report for the General Assembly as a .pdf-file. 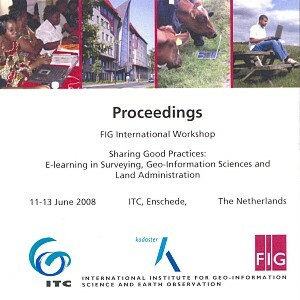 Proceedings of the FIG International Workshop - Sharing Good Practices: E-learning in Surveying, Geo-Information Sciences and Land Administration organised by FIG Commission 2, ITC (International Institute for Geo-information Science and Earth Observation) and Kadaster, The Netherlands. FIG Commission 2 has started Mentorship Programme Network together with Lund University. Initiative to this mentorship network was created during the the FIG-congress in Munich in October 2006. The aim is to create a worldwide network for student mentorship programmes. The programme has now started at Lund University (Sweden) for final year students at the MSc engineering programme in Land Surveying and Management. The student has got one professional land surveyor as his/her personal mentor during the final year of studies and thesis work. The mentorship programme is organised at Lund University, but integrated in the activities of the Swedish Association of Chartered Surveyors and the Swedish Society of Real Estate Economics. At the second phase the Network is now interested to get other universities involved. The leading idea is to create a network of membership programmes, and provide the students with contacts to other students abroad. They are likely to develop the network, e g, with a student forum, personal blogs, wikipedia and other network links. The mentors could also join the network, but we believe that the students might be the first enthusiasts to develop the network. Read more about the programme in the invitation letter. As a first tentative approach, the Lund University International Student Forum for surveying students and mentorship programs is launched at http://fig-forum.student.lth.se/index.php. The international mentorship network will be initiated gradually. The Mentorship Programme Network will be part of FIG Commission 2 activities in 2007-2010. Prof. Bela Markus from Hungary was appointed by the General Assembly in Athens as the Chair Elect of Commission 2 2004-2006. He will be the chair of the commission 2006-2010. Bela is the Head of the College of Geoinformatics at the University of West Hungary in Szekesfehervar, Hungary.